Eighteen new projects: bed covers, hooked rugs, pillows, tablerunners, whimsical sewing items – even a jacket and toe warmers. As always, many are inspired by the antiques Maggie collects. 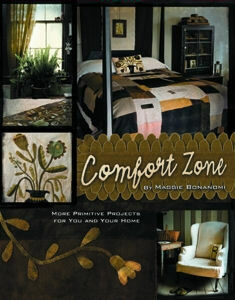 Helpful advice is included as well - Maggie includes instructions on how to add an aged look to your projects. She lists helpful items to collect to create these primitive projects. She describes many thrifty tips for working with recycled and re-purposed items.